Last year I wrote about Jacqui Marcella’s photo of two couples standing in front of an airplane in The Plane Truth. I’m revisiting a few of my older columns to see if I can discover anything new about those pictures. When I looked at this 1920s image I thought, “Why not?” Imagine my surprise when a closer look at some of the details revealed that this simple family picture was a historically significant photo! The couple on the left are Jacqui Marcella’s grandparents, Arthur and Theresa Henschel, but the couple on the right are a mystery. I initially assigned a timeframe of 1926 to 1930, but this “fresh look” narrowed that even further. Take a close look at the T to the right of the second couple. It holds the key to this image. I searched some of the links I recommended in the original article, and found an exact match! The T is part of the name of the plane, the Smiling Thru. If you look closely, you can see part of a G behind the man on the right. Compare this photo to the photo I found on the Wichita Photo Archives site—the plane’s name in that picture is the same font as the T in Jacqui’s picture. For company president H.L. Ogg, it was a corporate office in the sky with dictaphone, telephone and lavatory. His secretary typed letters while they flew around the country. Strip out the office equipment and the company could use it to deliver washing machines. 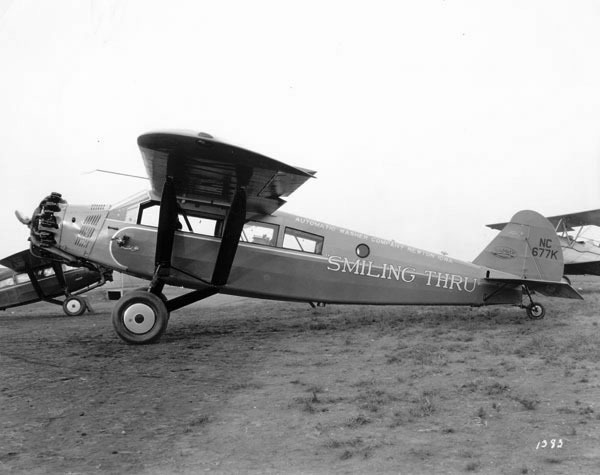 The Automatic Washer Company bought this plane from Travel Air in 1929, then sold it in 1934. Based on the clothing here and the aircraft’s history, Jacqui’s grandparents probably posed for this portrait in about 1929. The history of the plane also suggests the other couple might be associated with the Automatic Washer Company. I know the man isn’t Ogg, but perhaps its another representative. Jacqui thought of this portrait as a family picture, but its actually a piece of American history, since very few pictures of the Smiling Thru still exist. You can read more about it in an article in the Newton (Iowa) Daily News. By the way, Jacqui, please send me your new email address. I was unable to contact you to provide this update on your photo. This entry was posted in 1920s Photos, Female Ancestors, Photo Detective and tagged group photos, men, photo backgrounds. Bookmark the permalink.